If you're looking for a quick and easy dessert to whip-up this holiday season, then have I got a recipe for you. These bite-size, mini-cheesecakes may be small but they pack a big flavor and they're picture perfect for any festive gathering. You won't need many ingredients for this treat. Gather a few dozen vanilla wafers, two, 8-ounce squares of cream cheese, 2 eggs, 3/4-cup sugar, 1-teaspoon of lemon juice, 1-teaspoon vanilla ,1-can of cherry pie filling and one box of cupcake tins. Preheat oven to 325-degrees. Set the vanilla wafers and cherry pie filling to the side. Mix all other ingredients together until creamy. It doesn't hurt to have a set of little hands to help you with this part of the process. Thanks Jordy! Place one vanilla wafer in each cupcake wrapper. The wafers create the tasty bottom of the cheesecake that is typically made of graham crackers. Vanilla wafers are a great size for this and they're so much easier than making a graham cracker crust from scratch. Once your batter is thoroughly mixed, just spoon a portion into each cupcake wrapper. Fill the cupcake tin about 3/4 full. Bake for about 20-minutes. After removing from the oven, allow to cool on a cookie rack for a few minutes. The cooling process will cause the center of each cupcake to sink just a bit. This creates a shallow crater that is ideal for holding a tasty scoop of cherry pie filling. 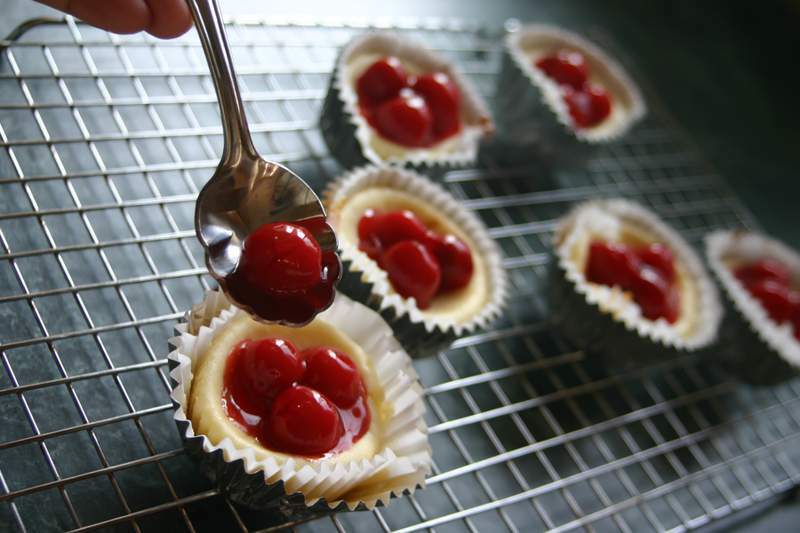 Allow the mini-cheesecakes to chill in the refrigerator for about 2-hours before serving. The chilling really sets the mini-cakes nicely and they just peel right out of the cupcake wrapper with no effort and no sticking. After you've peeled the cheesecakes from the wrapper, arrange them on a decorative holiday platter for a pretty and delicious looking serving. When your guests want a sweet treat to hit the spot after that holiday dinner, you'll have the perfect bite-size offering. 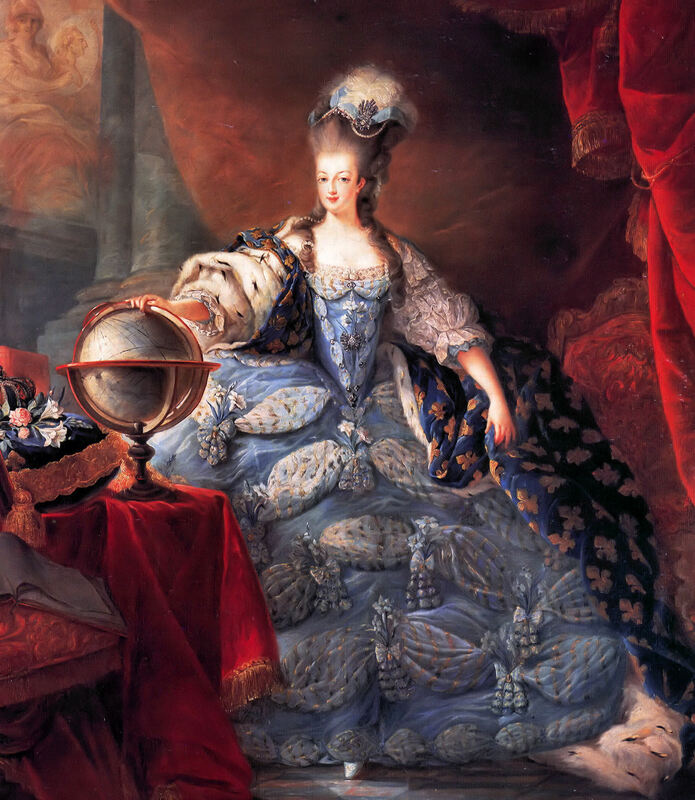 While, Marie Antoinette may have been wrong to utter that now-infamous phrase, you on the other hand, will be absolutely right this holiday season when you declare "let them eat (cheese) cake". I like the thought of cuplets because they seem so little and seem there might be less calories in a cuplet. Mine are in the oven as I write. Thanks for a wonderful blog! ps I added some chocolate chips on a few, and used two nilla wafers, just because I love them. My Memaw used to make these cheesecakes all of the time! Her recipe was a bit different, it didn’t have lemon in it. I am new to your blog and I think it looks great! My mom used to make those mini cheesecakes for me when I was a kid so that post brought a smile to my face. They certainly are delicious! What a delicious looking treat! I’m going to have to try these! I can attest… these are really yummy! I usually make them on the fourth of July, one batch using cherry pie filling and another batch with blueberry. I love your presentation, Lisa. How yummy these look! I hope you and your family enjoyed the brightest and most beautiful Christmas Day ever! Have a lovely rest of the week! I love these! Merry Christmas Lisa. I hope you and your family have a wonderful holiday! Just stopping by to say Happy Holidays! That cheesecake looks divine, too! Hope you have a great holiday! Oh my, this looks fabulous! Thanks for sharing and have a very special Christmas! LOVE your blog! I have been following it for awhile! In fact, I just nominated you for a blog award, although I’m sure you have several! So Tasty!!! I am currently in TX with my family. Maybe we can make this fun treat! Have a great Christmas!!!!!!!!!! Aren’t these wonderful?! I enjoyed your lovely tutorial. I wish I could borrow your helping hands – what fun! Cheesecake is DIVINITY…end of story! This just the thing I’ve been looking for. They look perfect and delious!! Thanks so much!! So cute! I love any that is quick and easy, but still looks good. So easy to make. This is perfect for this busy season when friends and neighbors drop in for coffee and dessert. These are a favorite treat to share at work, easy & no mess to slice! TFS this to all and have a really happy holiday! This is why everyone gains 10 pounds at Christmas. These look SO good. I’ve made these (or some similar variation)and they’re wonderful! The cookie works so perfectly as a crust. I’ve made them, adding mini chocolate chips to the batter instead of putting cherries on top, too, with yummy results…You know, I’ve never tried to peal the cupcake liner off of them for presentation. Duh. Why didn’t I realize how much prettier they are your way?? That top photo is beautiful! You are always, always inspiring! Lisa, thanks for this great recipe – looks so yummy and not too overly indulgent! Oh I can’t wait to try this. I happen to have all of the ingredients. WOW! Oh, that does sound easy! I might have to try those out. How about a gingersnap at the bottom? Thanks for sharing. wow, I pretty much need to make these..STAT! YUMMO!!! They look delicious! Cheesecake is my favorite. oh lisa – those look delicious. and easy to boot. i will be making some of those next week. thanks for the recipe!! YUM!!! Looks like you have an enthusiastic helper.